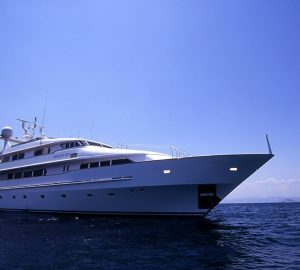 Motor yacht XANA (ex Iliki V, Sanctuary, Bliss, Ouranos Too) is a 41 meter (134.5 Feet) superyacht built by Cantieri Navali Codecasa in 1994. 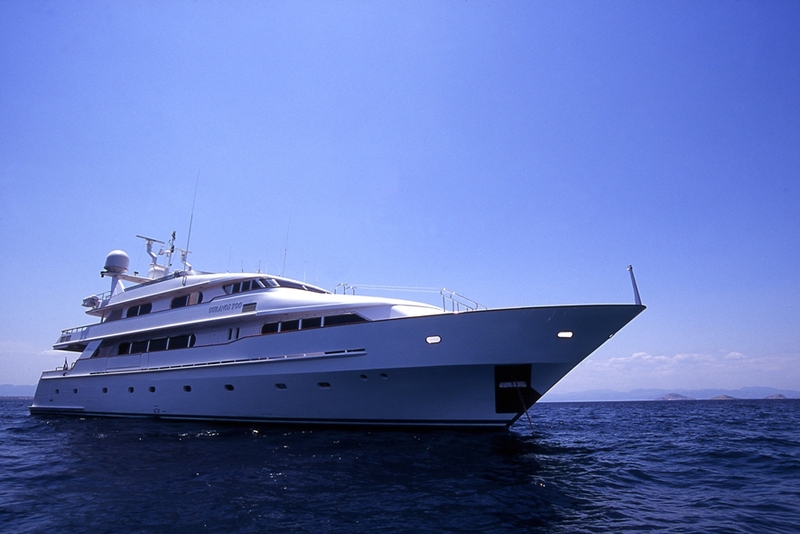 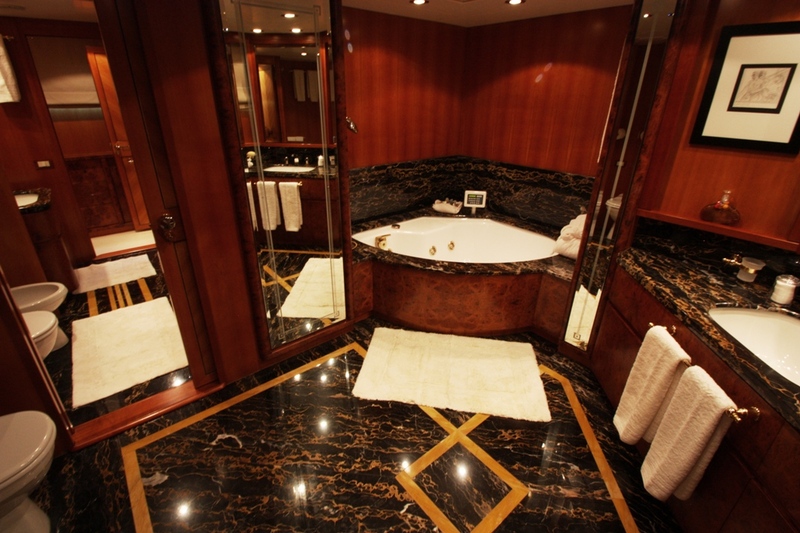 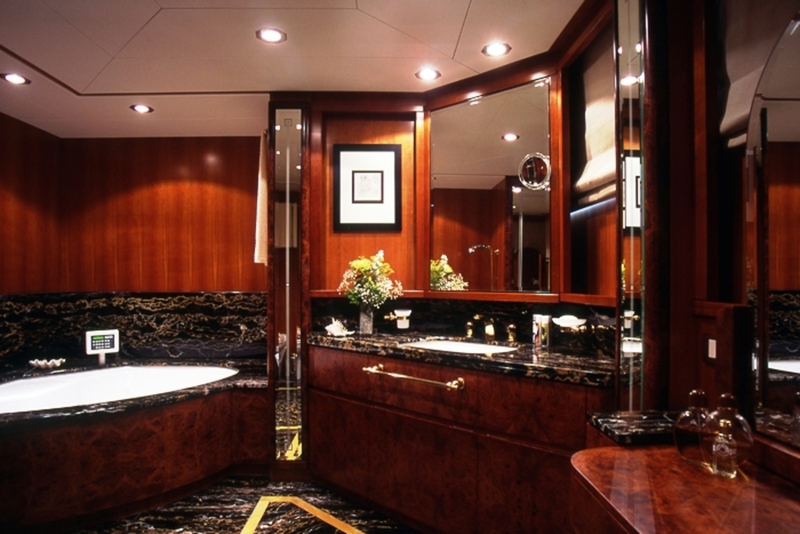 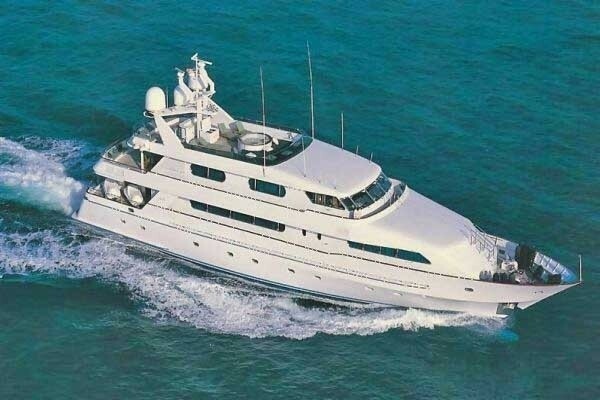 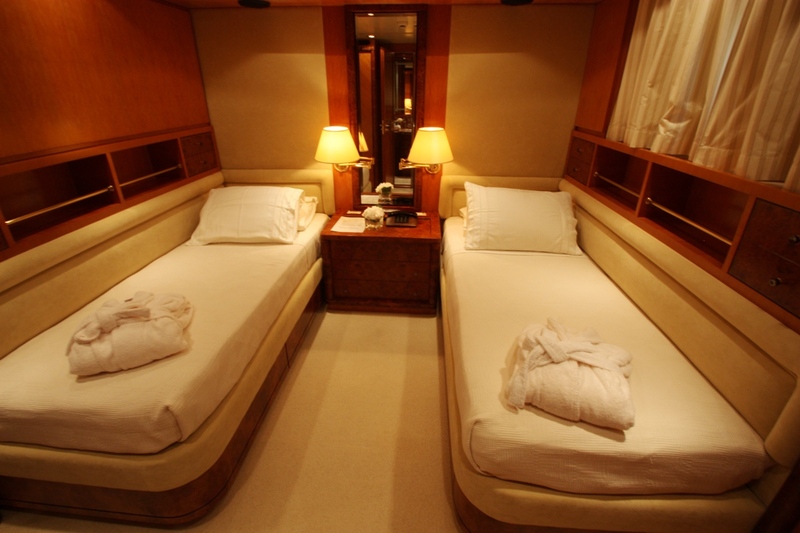 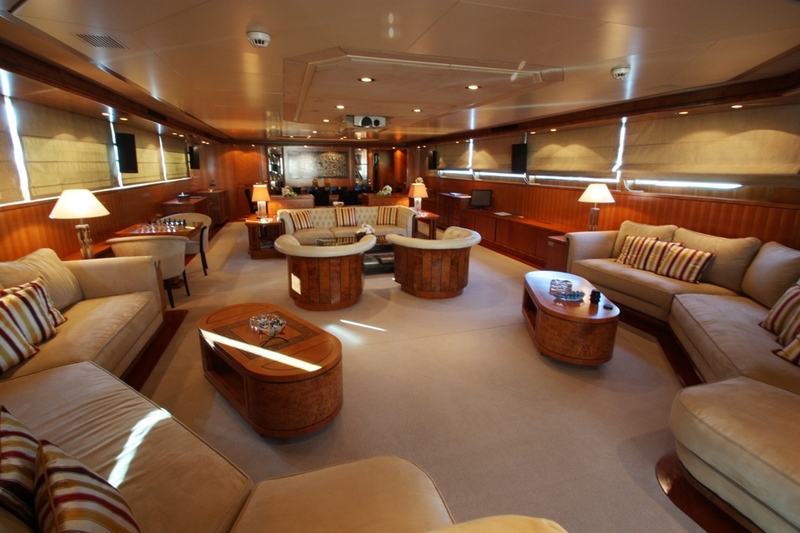 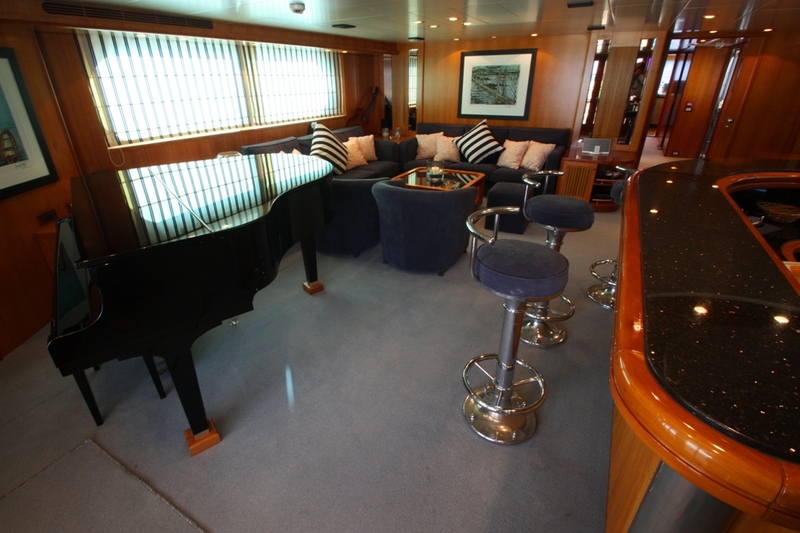 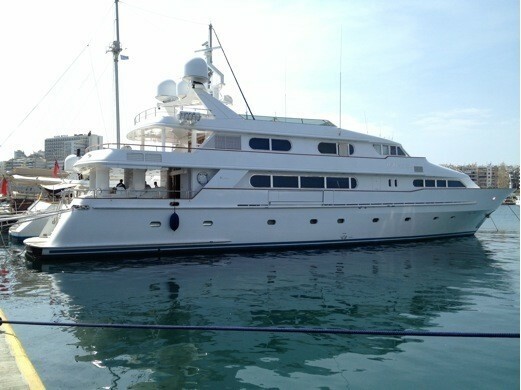 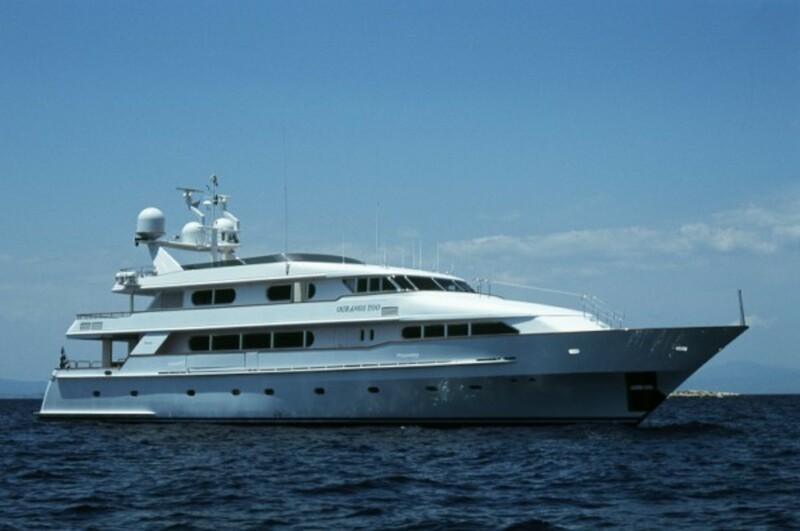 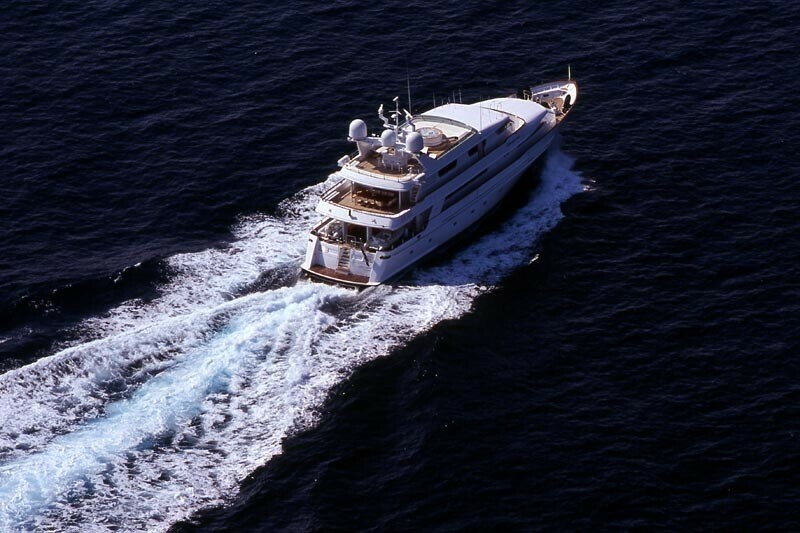 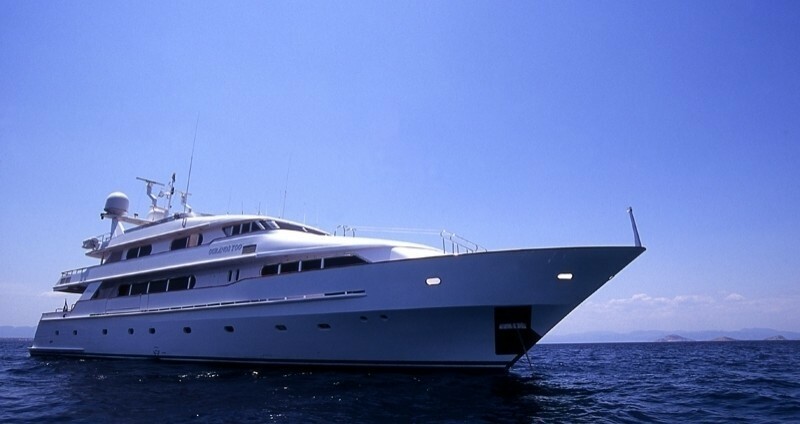 She is able to accommodate up to 12 charter guests in 6 spacious cabins. 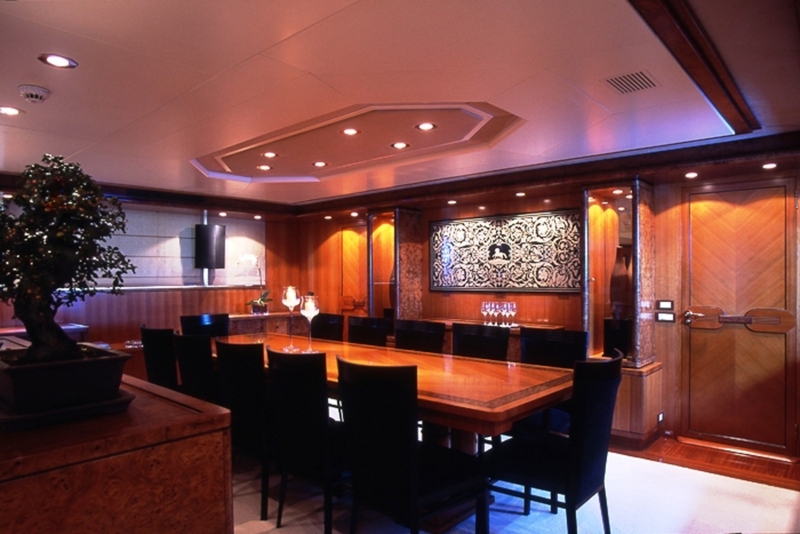 M/Y XANA boasts beautiful solid cherry wood throughout the yacht accented by burled cherry crafted from the root of the tree, which the yacht can handle weight-wise because of her solid steel hull construction. 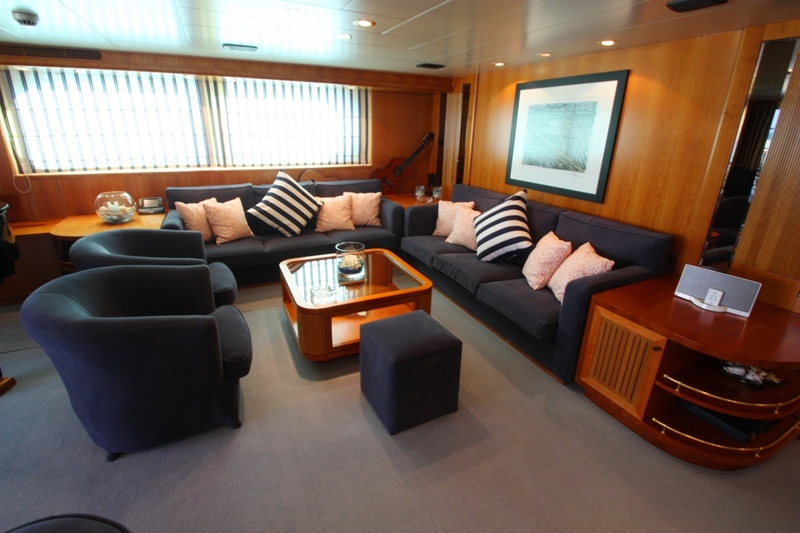 The yacht has a large main salon that is welcoming and comfortable furnished in neutral colours complementing the woodwork. 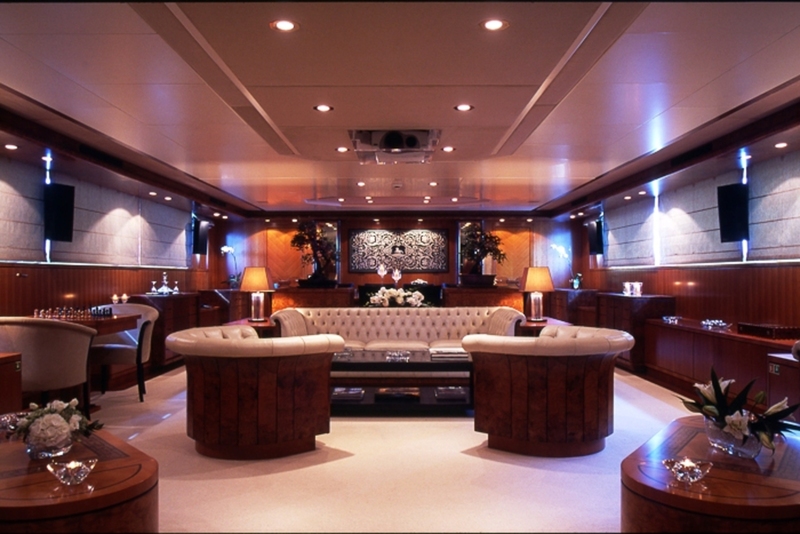 The salon has curved couches set against the aft wall, a games table, and another fixed couch with coffee table and occasional chairs providing several different areas to relax depending on the mood. There is an adjoining formal dining area further forward. 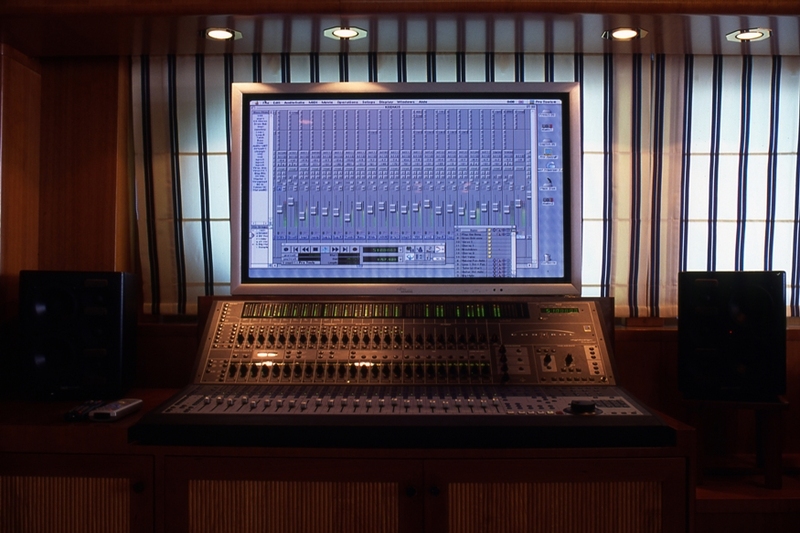 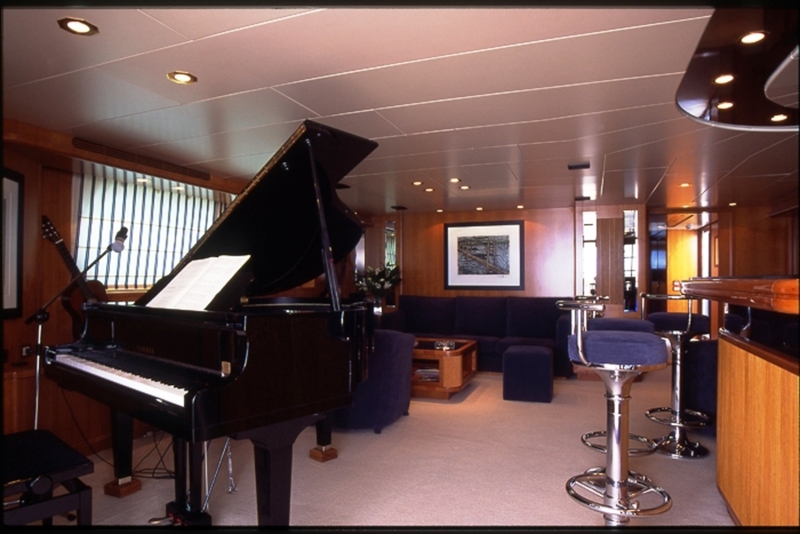 The sky lounge on the upper deck boasts another seating area, a bar and a grand piano plus a professional mixing desk/recording studio. 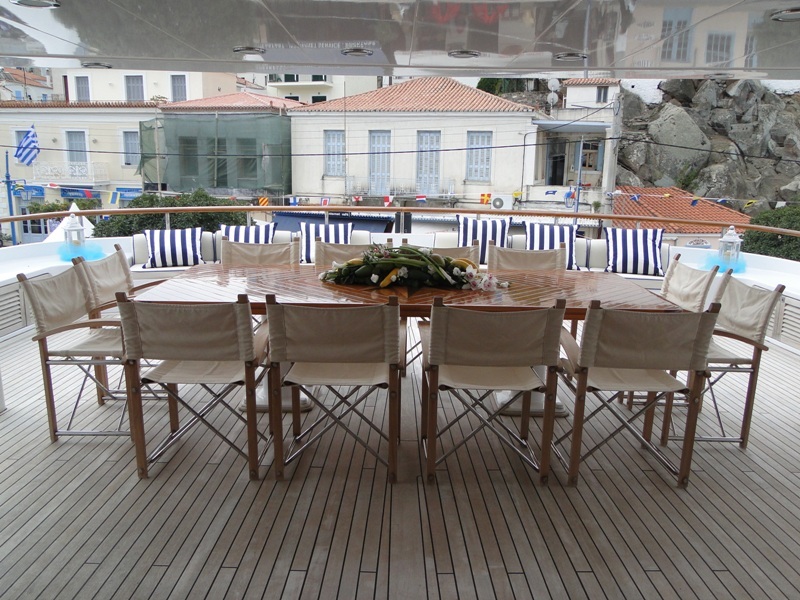 XANA is able to accommodate 12 charter guests in 6 spacious cabins with an 8 member crew offering silver service on board. 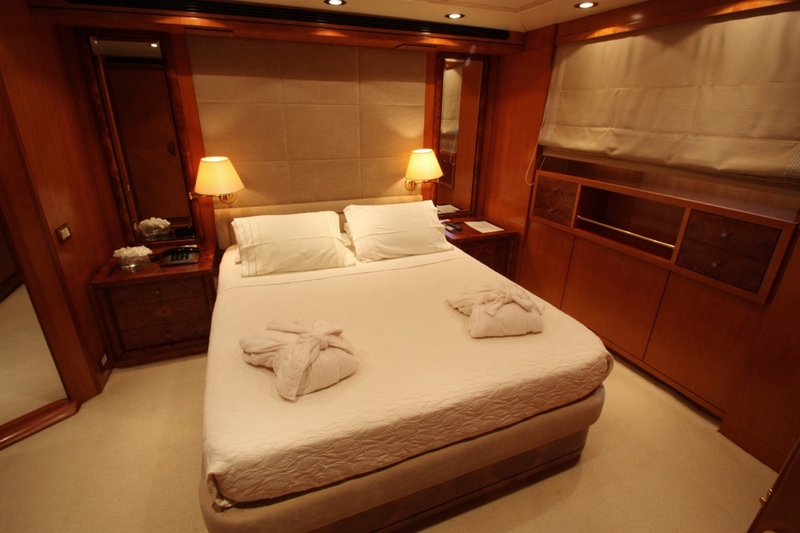 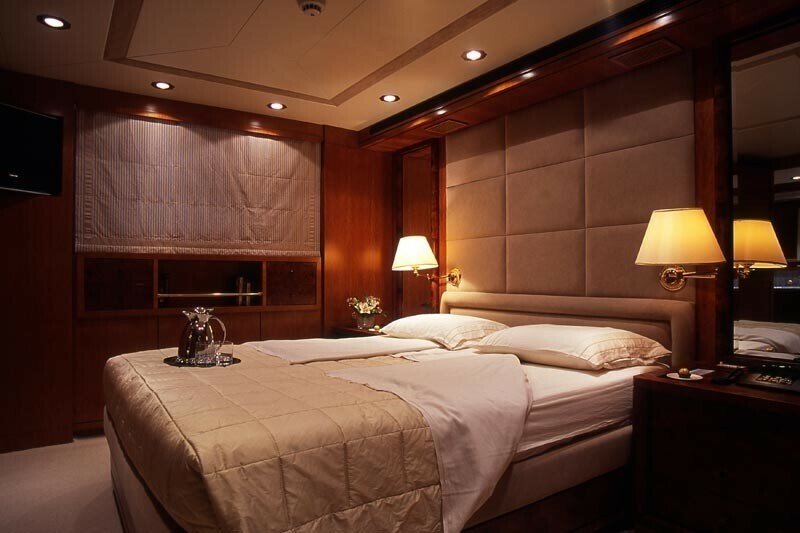 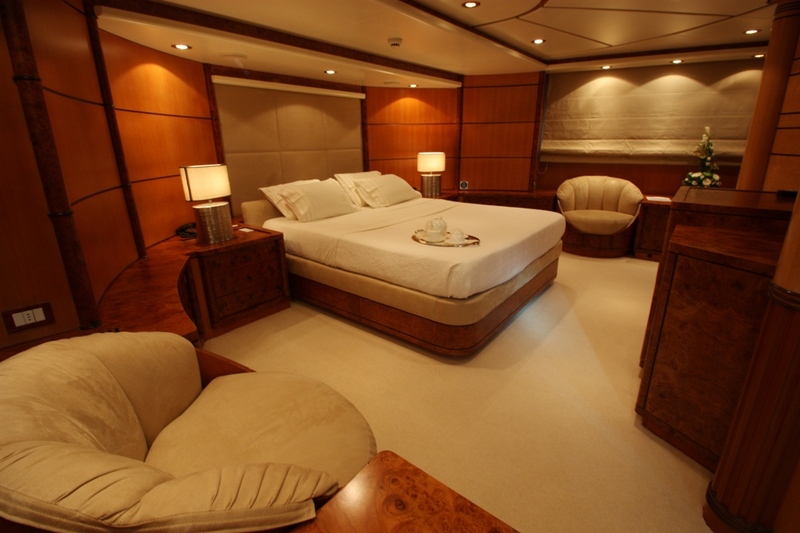 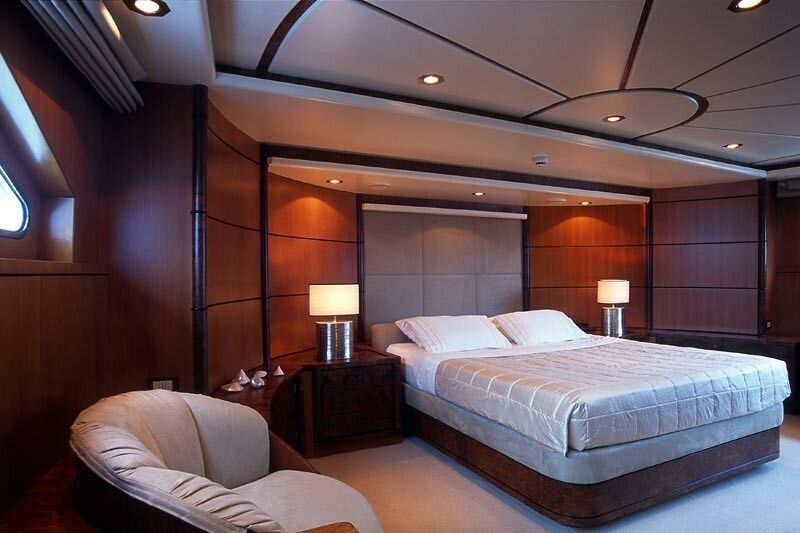 The Master cabin onboard XANA is located on the main deck and spans full width of the beam.The Master suite is located forward with separate office that can be used as part of Master suite or independently as a guest office. 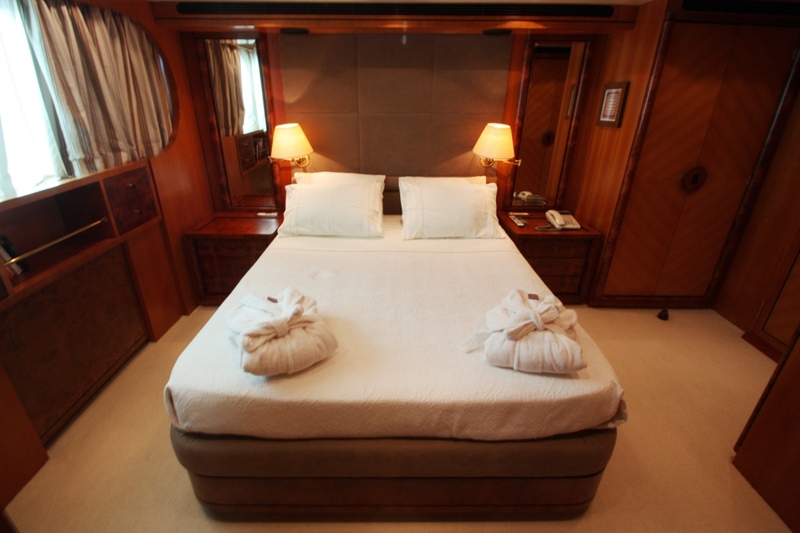 The cabins itself has a central Kingsize bed with a large walk in closet and an ensuite boasting a massage/steam/sauna shower, separate Spa Pool bath and twin basins. 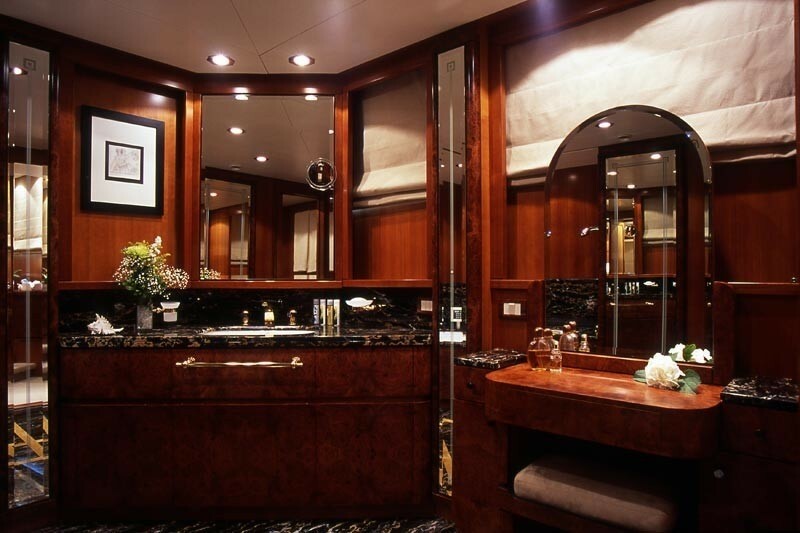 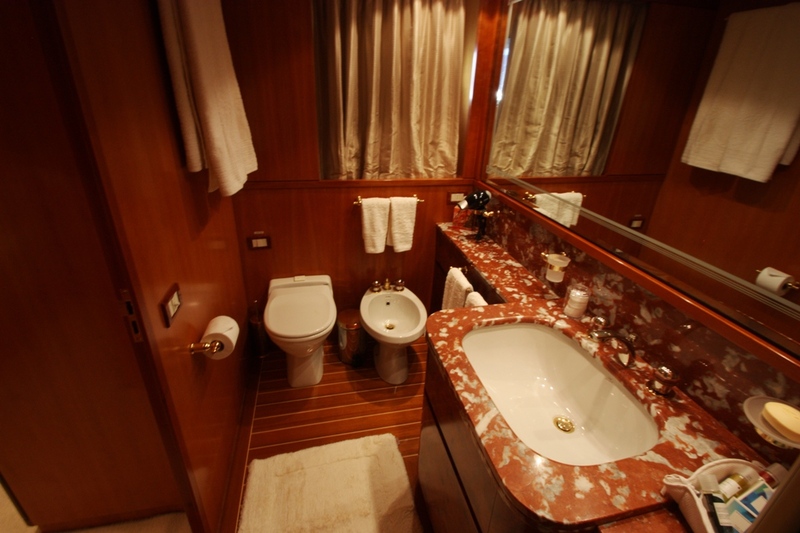 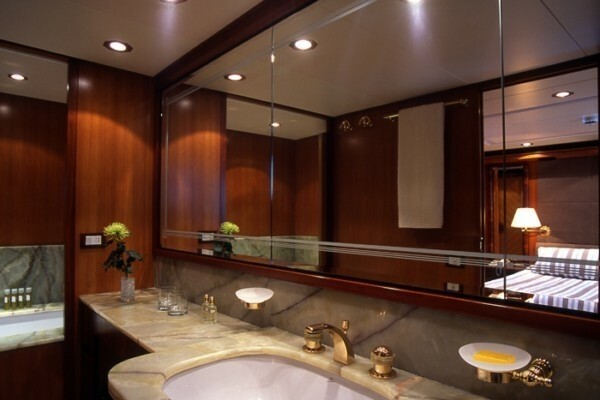 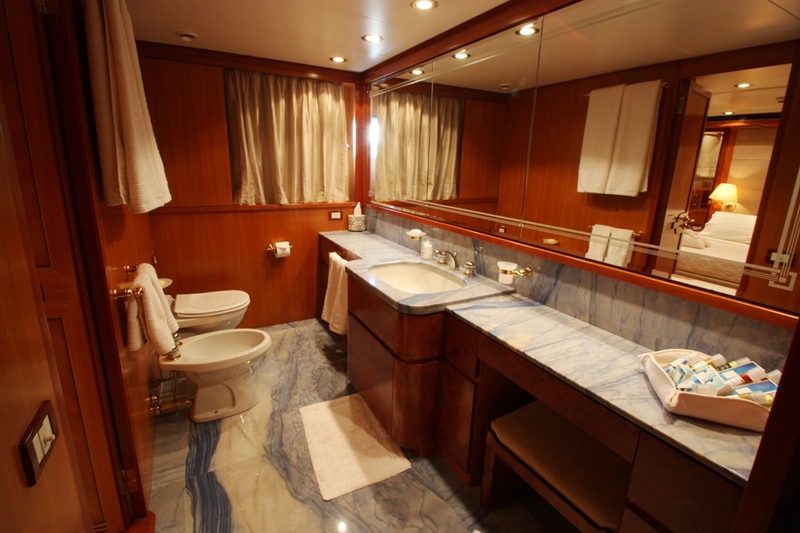 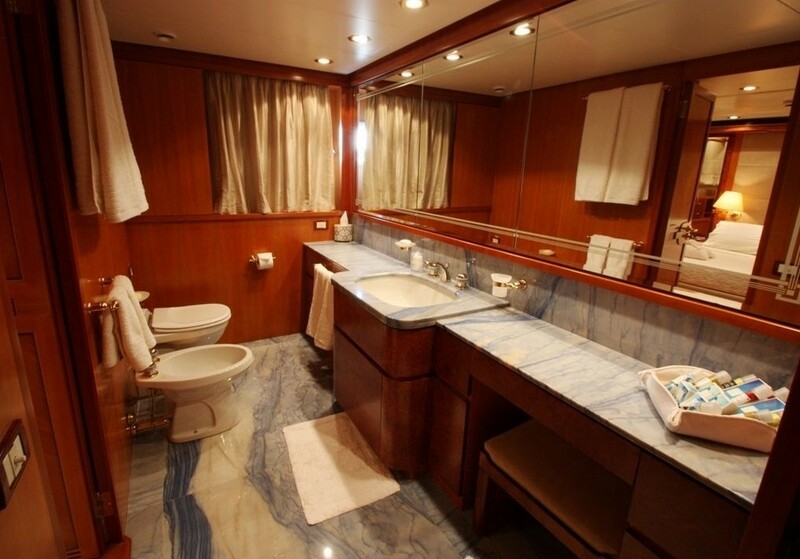 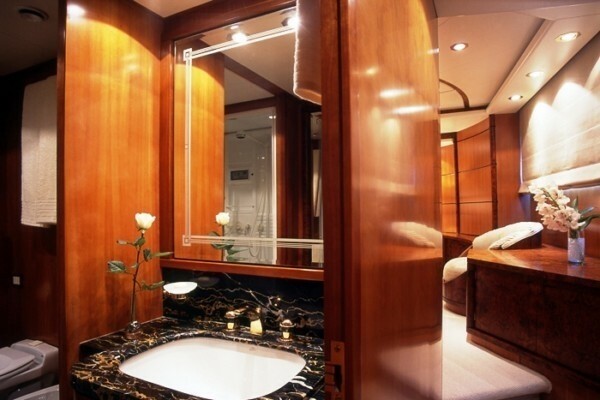 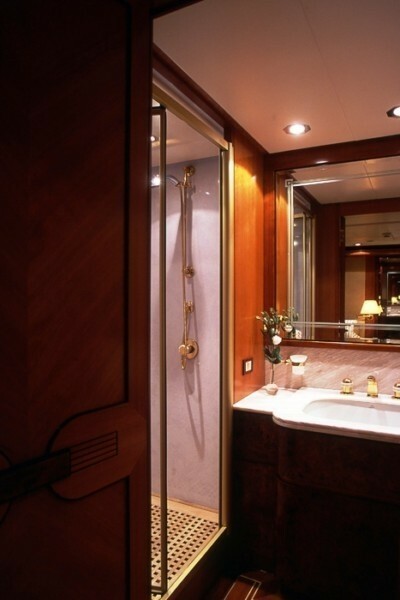 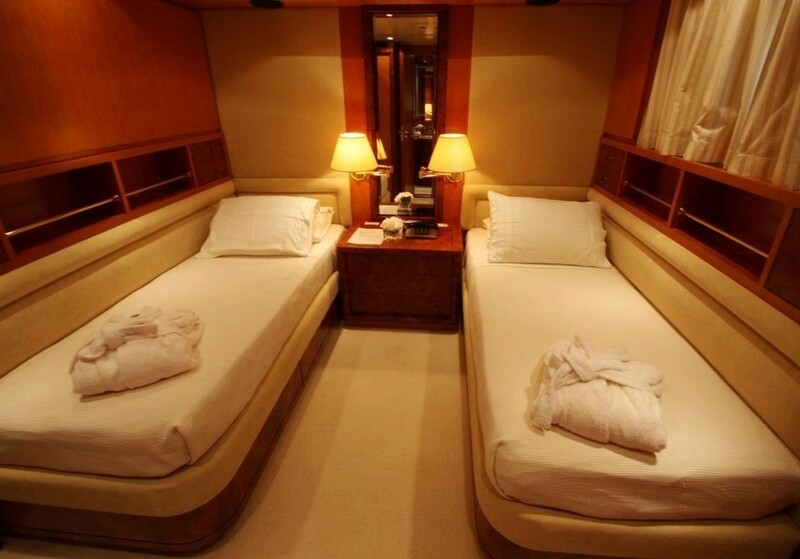 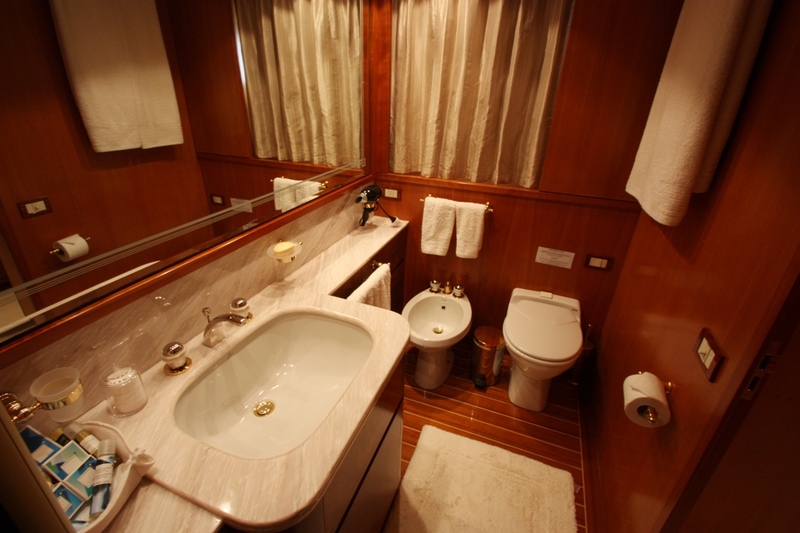 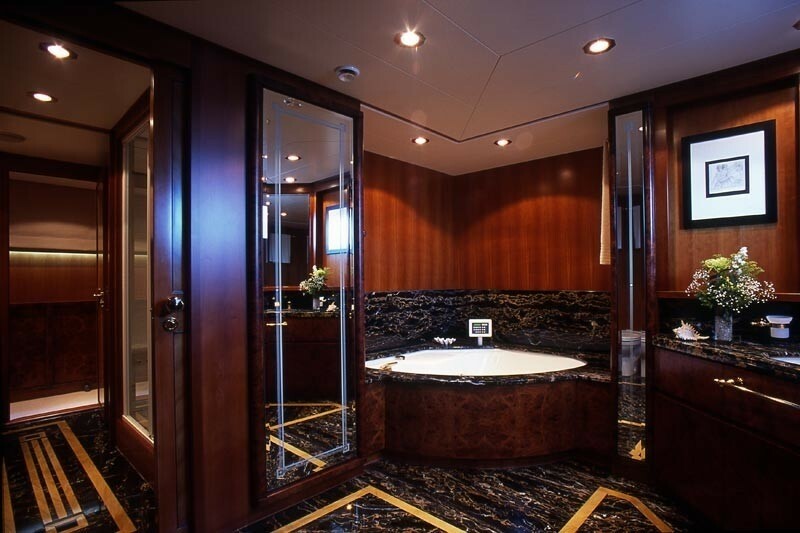 The VIP Cabin is located on the Upper Deck behind wheelhouse with ensuite bathroom and there are 2 twin cabins located on the lower deck each with pullam berths and ensuite facilities and two double cabins each with ensuite bathrooms. 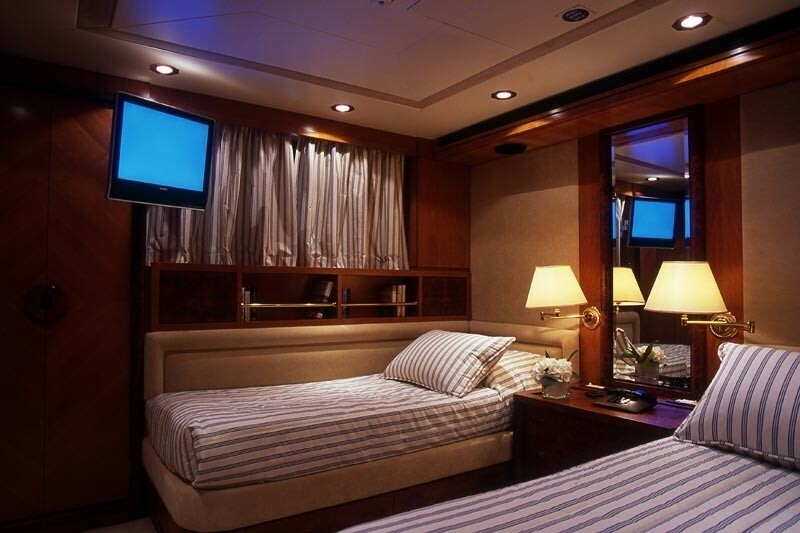 All guest cabins have flat screen TV/DVD/Satellite. 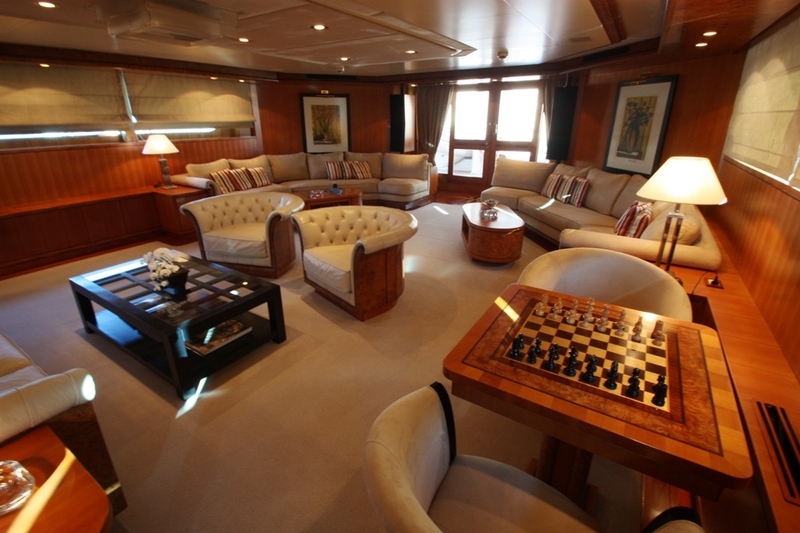 41m Codecasa charter yacht XANA received a comprehensive refit in 2007/8 which included a full exterior repaint of the hull and superstructure, fully refurbished and re-balanced propellers, extensive new plumbing throughout, a full main engine and exhaust rebuild, new generator sound proofing, an overhaul of watermakers with new membranes, a full overhaul of the air conditioning system, all cabin A/C fan coil units were overhauled, replacement of all engine room valves, pipework and wiring, Engine room repaint, Stabilizer rebuild, extensive replacement of cabling throughout, Shafts removed and re-balanced, New shaft seals, Tanks & tank tops refurbished and repainted, extensive interior repaint and varnish, extensive replacement of interior deck heads, New oven, wine chiller, dishwasher and washing machines as well as new carpets throughout. 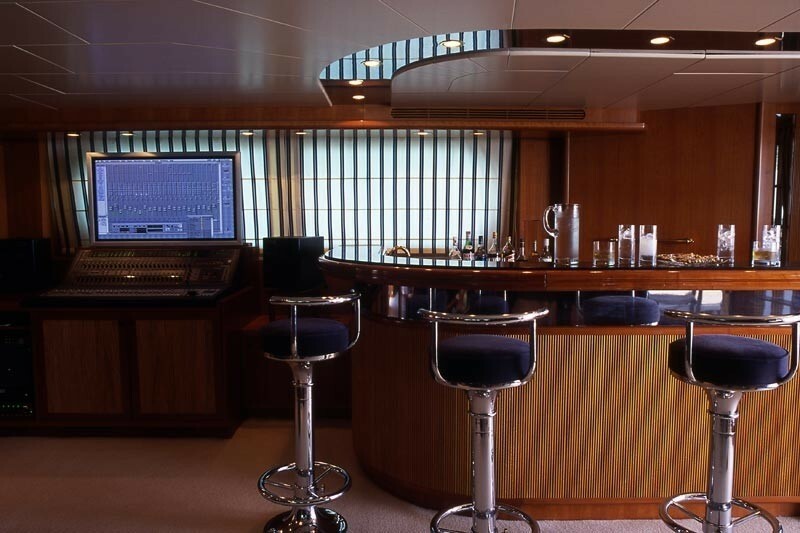 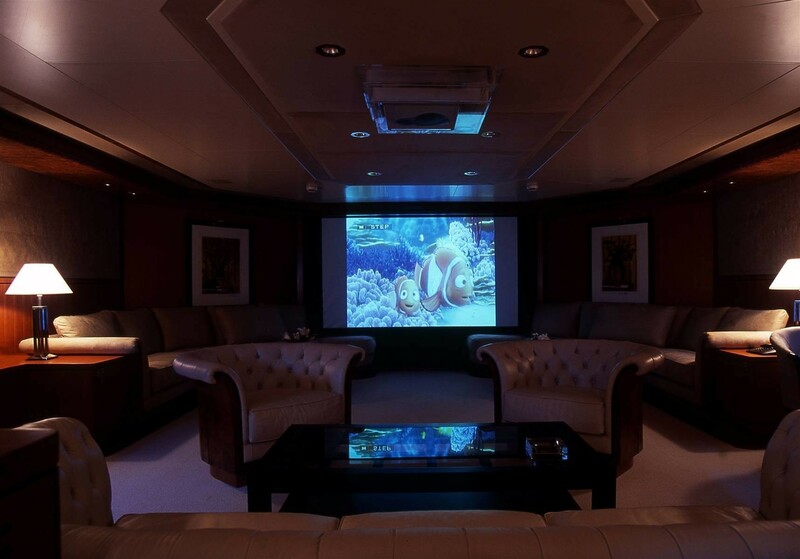 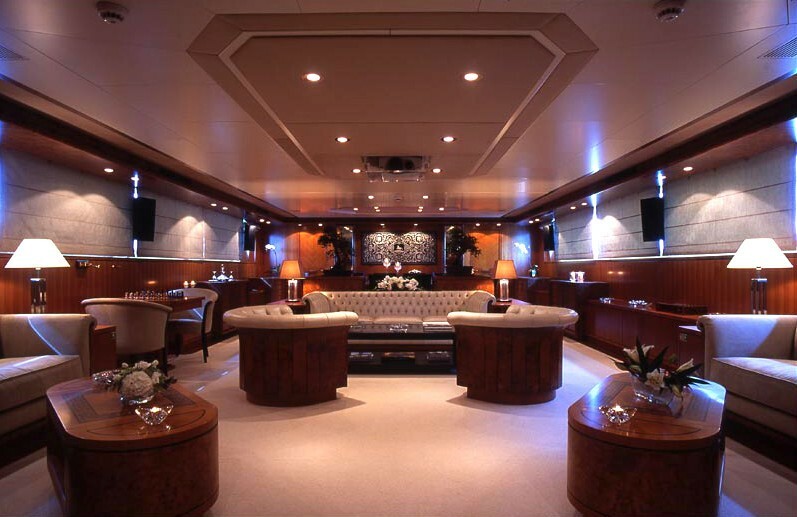 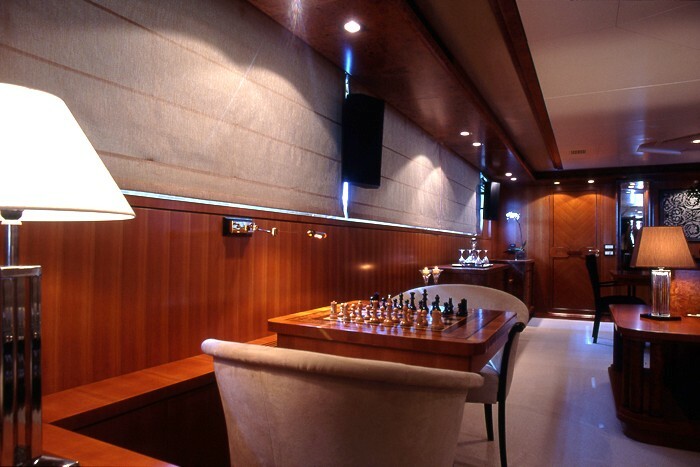 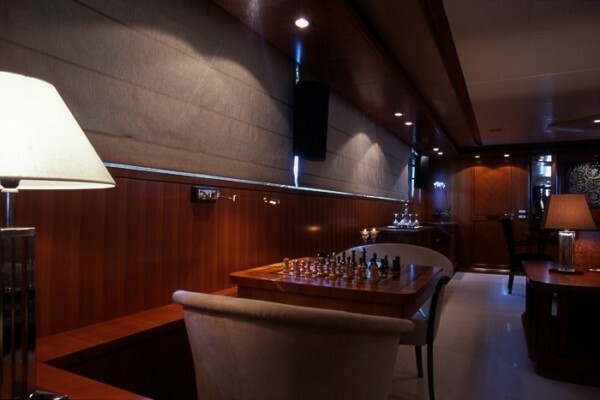 The yacht also received satellite television with independent receivers plus Sony PlayStations in every cabin, a WiFi Internet system, independent climate control systems plus an overhead projector with drop-down theater-style screen and blackout shades turning the main saloon into a virtual cinema. 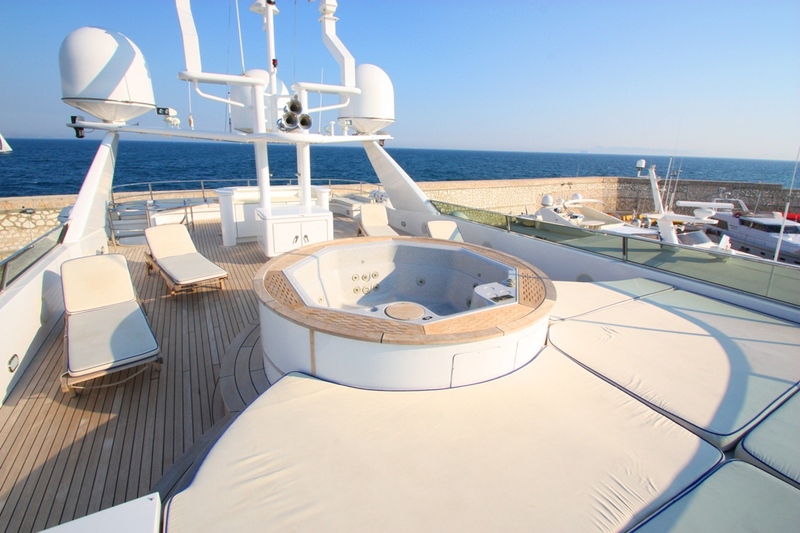 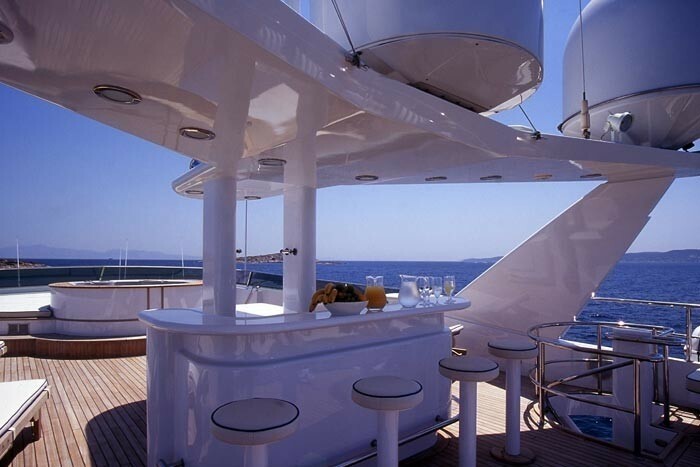 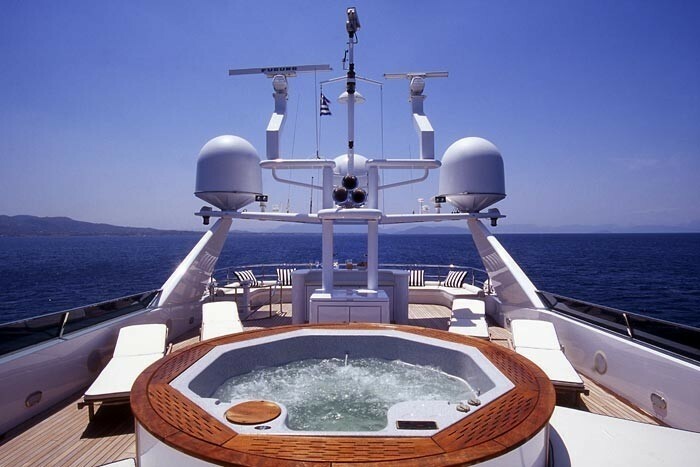 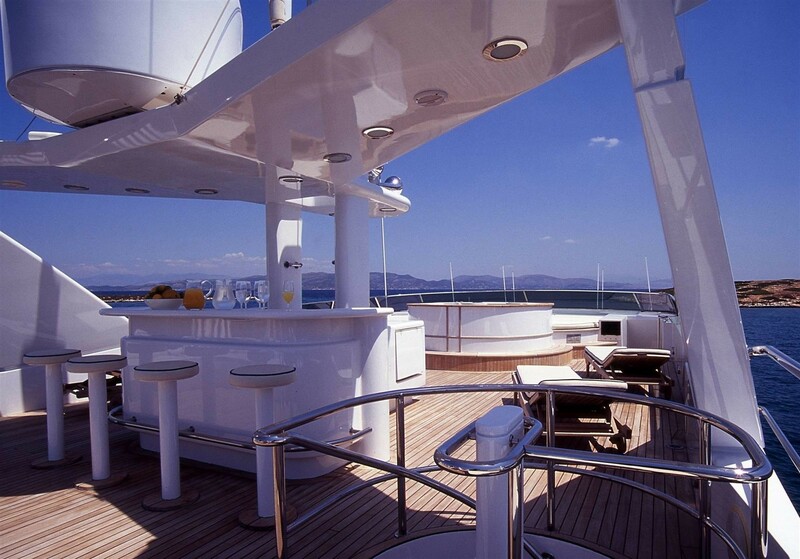 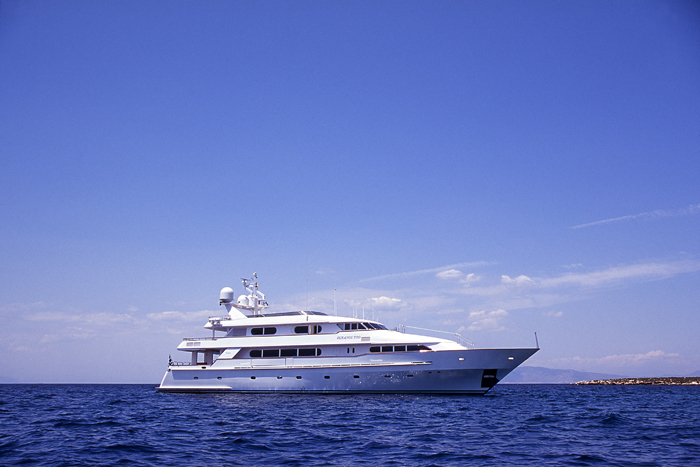 Superyacht XANA boasts a large sundeck with a Spa Pool and bar, as well as a sunbathing area. 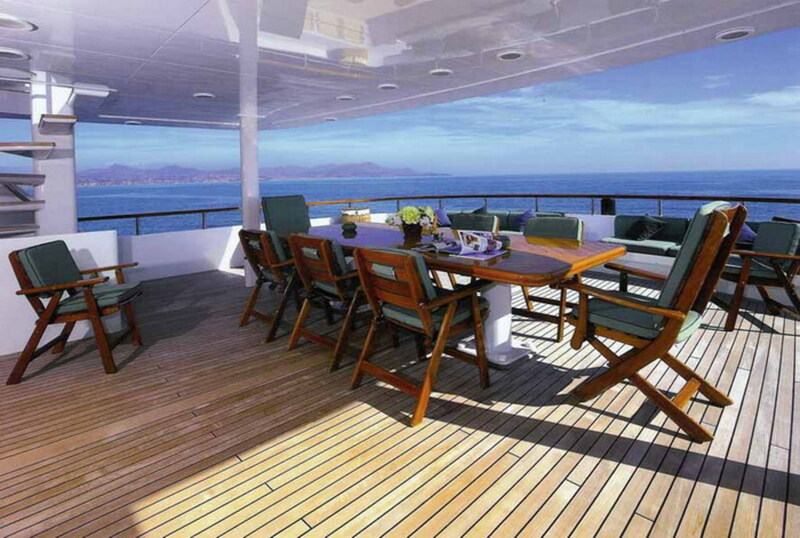 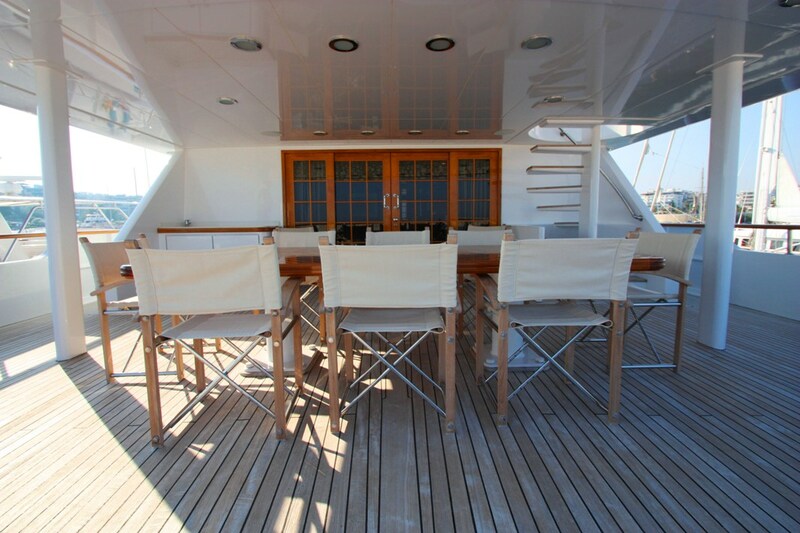 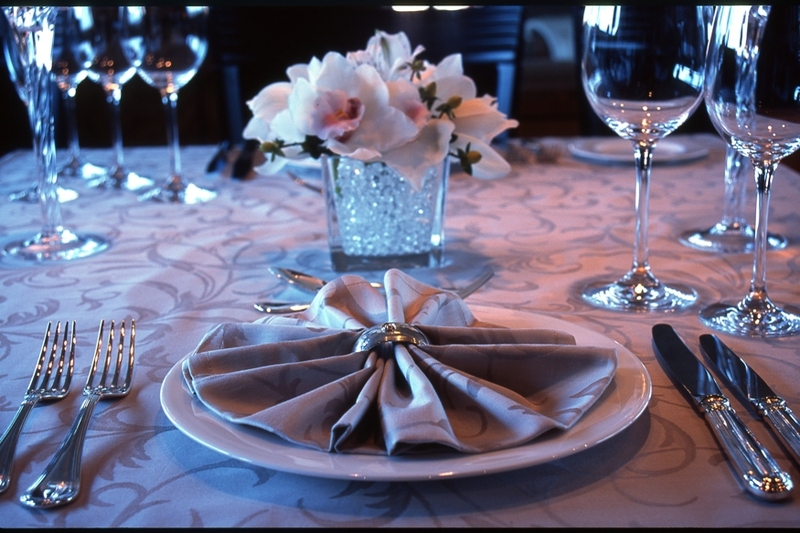 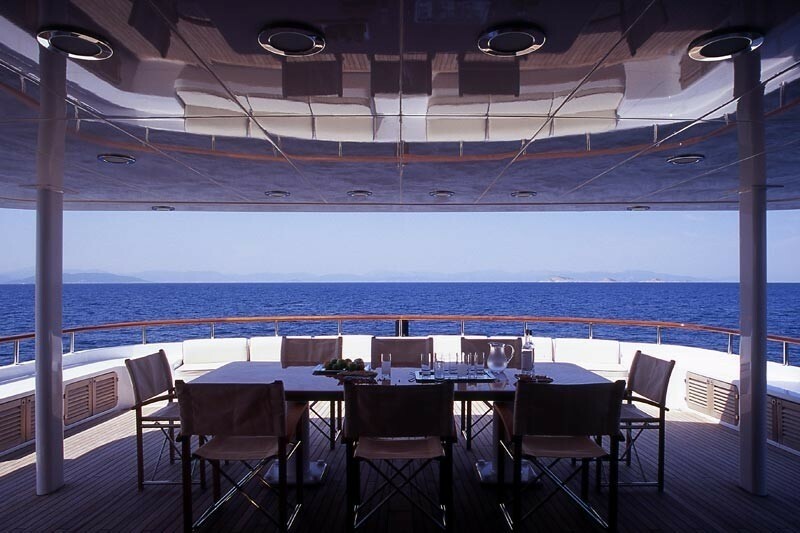 The upper deck features a large dining table so guest can enjoy dining al fresco. 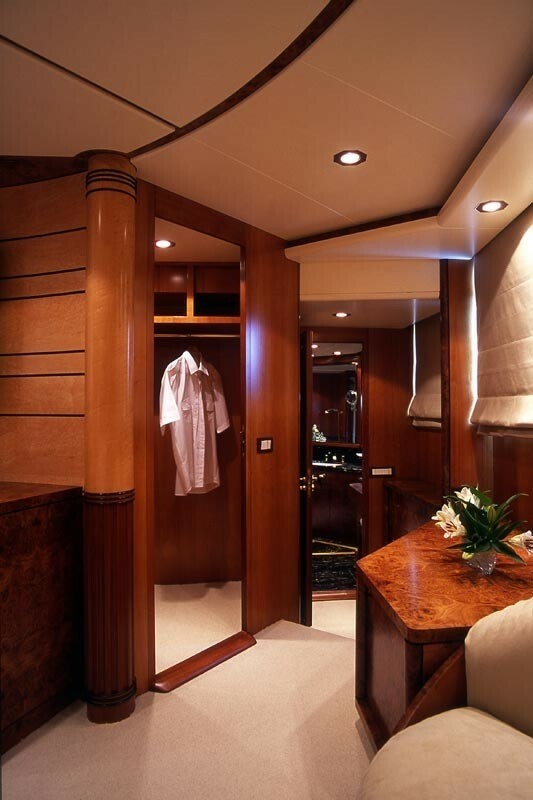 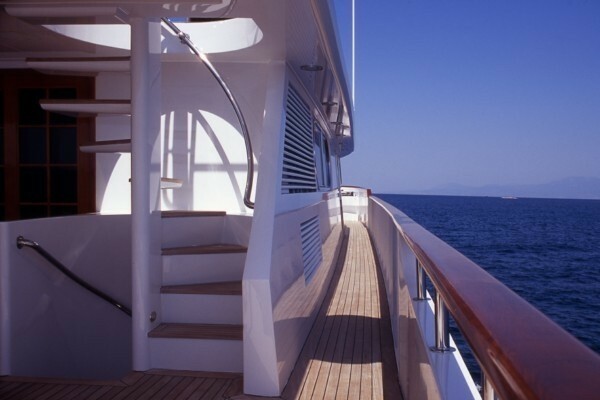 Her aft deck houses the tender and toys and there is a central staircase leading down to the large swim platform from the aft deck. 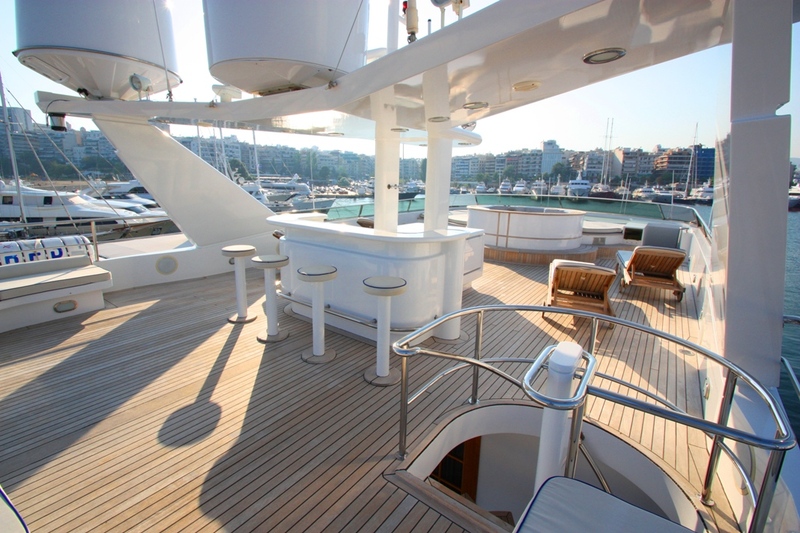 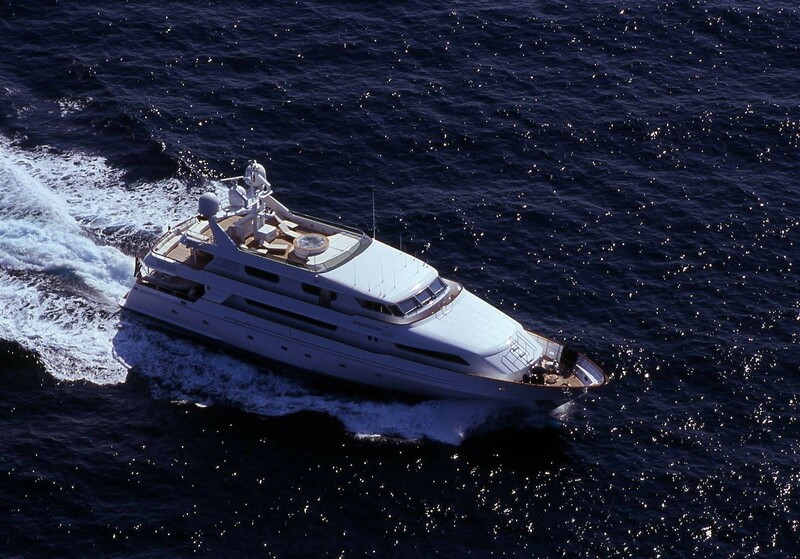 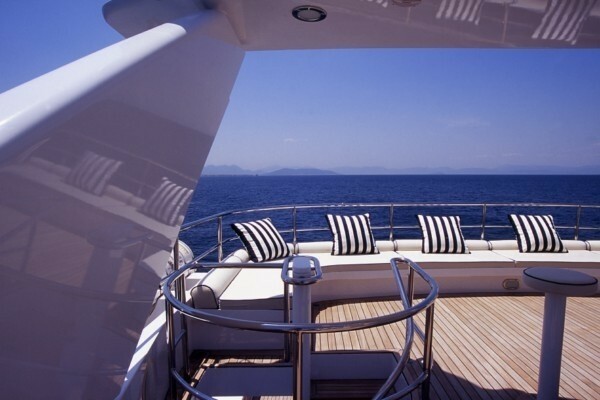 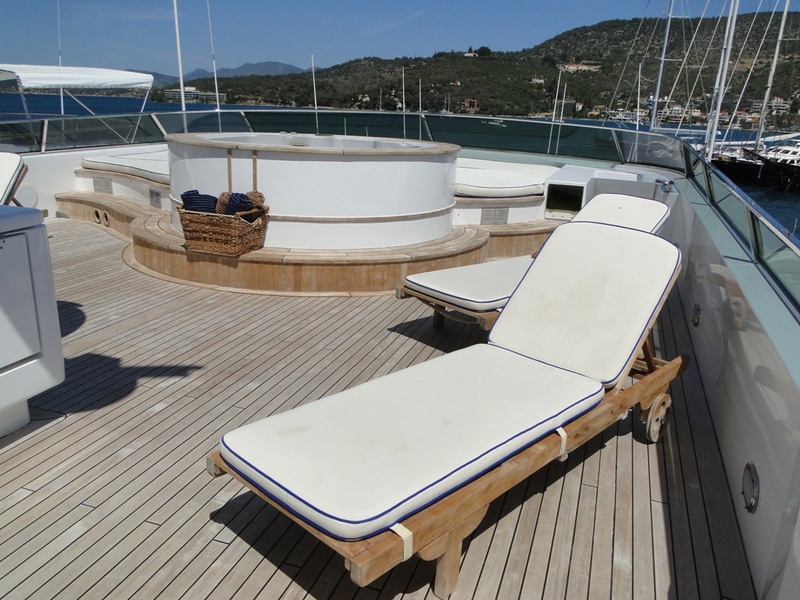 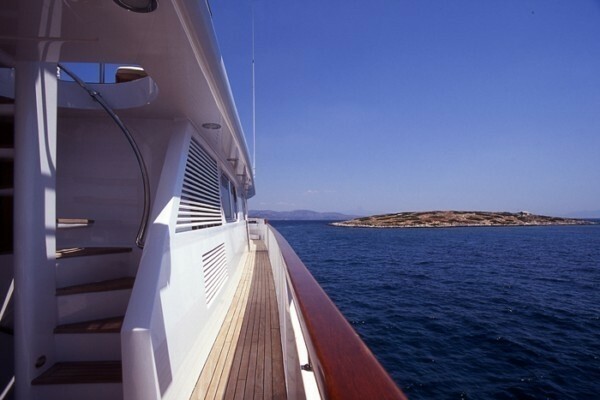 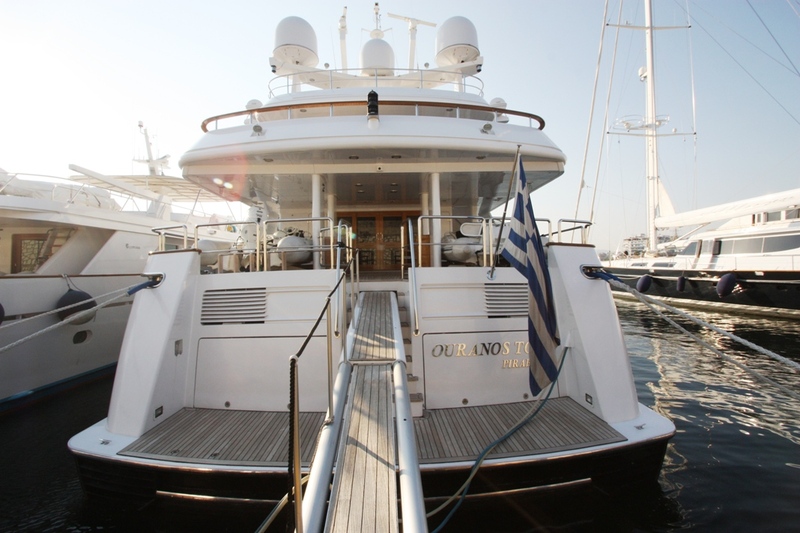 XANA has the following Tenders & Toys onboard for charter guests to enjoy. 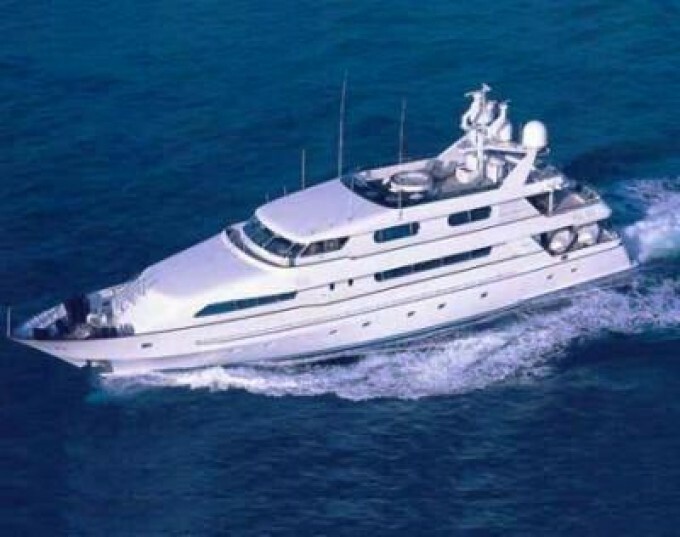 A 4.7m Zodiac tender with 70hp engine, 4.6m Nautica tender with 175hp engine, a Yamaha 750cc jetski, waterskis, kneeboard & tows, comprehensive selection of inflatable toys, fishing equipment, snorkelling gear. 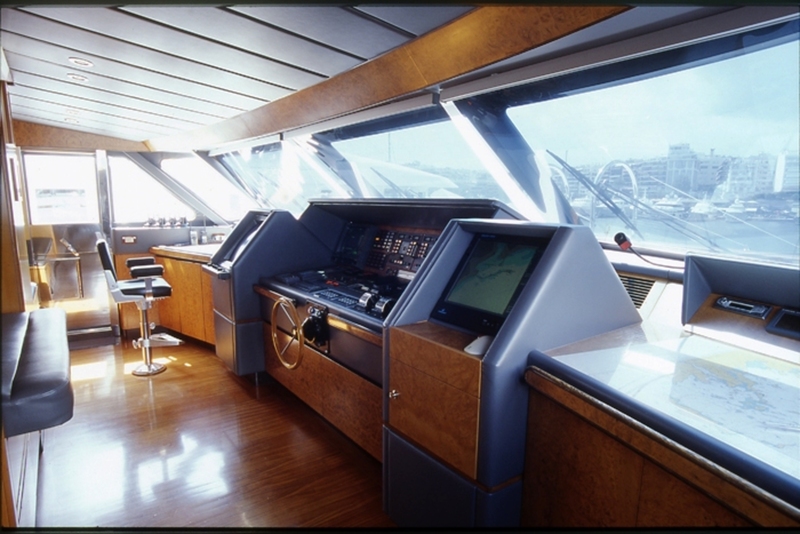 Communications include Satcom & cellular communications facilities. 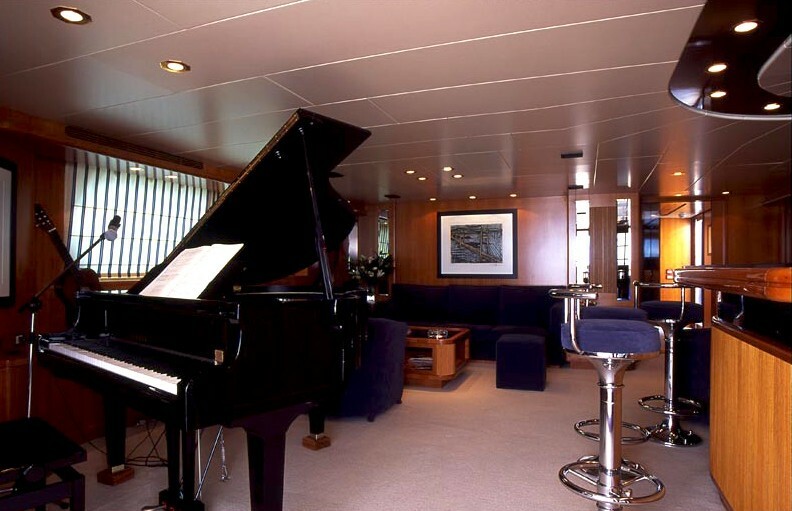 Audio Visual Equipment and Deck Facilities include Wi-Fi internet access, TV/DVD/Satellite in main saloon, sunlounge and all cabins, Comprehensive audio-visual system, Home cinema system in main saloon, Playstation 2 in all cabins, DVD/CD library, Professional mixing desk/recording studio in sun lounge.